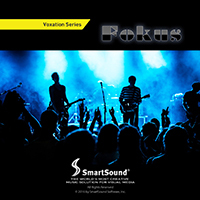 Tight pop-rock interspersed with hard edges populate this album of the up and coming band Fokus. Their debut album features powerhouse, infectious tracks with compelling vocals (as well as two great instrumentals!). The lyrics cover a wide variety of themes from upbeat-positivity, storied heartbreak, love conquered and more. From SmartSound's Voxation label, it represents our commitment to offering the best music available for any film or video use, including vocal tracks from great indie bands and artists. Using SmartSound's unique technology, you get complete control over the placement and timing of any vocal line, or take them out entirely for great pop-rock backing tracks; these tunes serve double duty.